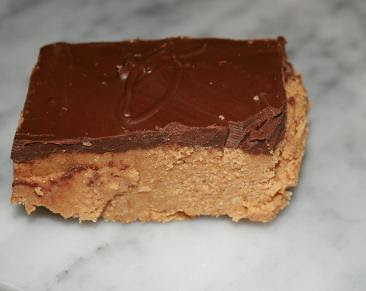 Super simple, no-bake peanut butter bars. The recipe is from http://www.allrecipes.com/. Mix the butter, graham cracker crumbs, powdered sugar, and 1 cup of peanut butter. Press into a 9 x 13-inch baking dish. Melt the chocolate and 4 tablespoons of peanut butter in a double boiler, or in a small pan over very low heat. Pour the chocolate mixture over the graham cracker crumb mixture. Refrigerate for at least one hour before serving. Those look yummy! I have all the ingredients and may make them today. I hope you enjoy them. They taste just like a Reeses Peanut Butter Cup.